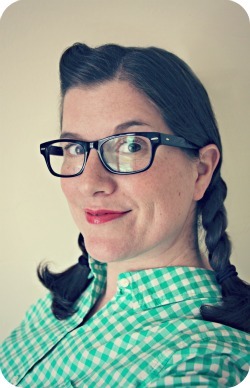 WhiMSy love: Polka Daisy Giveaway! 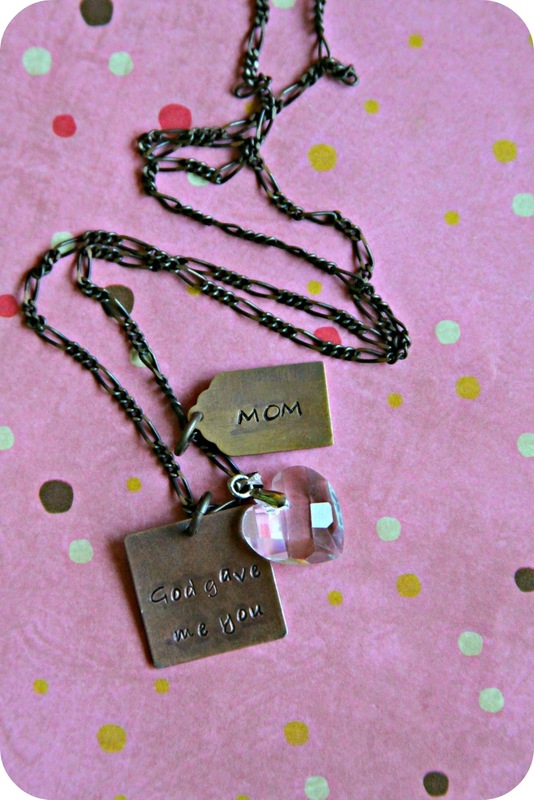 Check out the super cool gift I got my mom for Mother's Day from Polka Daisy. I love hand stamped jewelry. 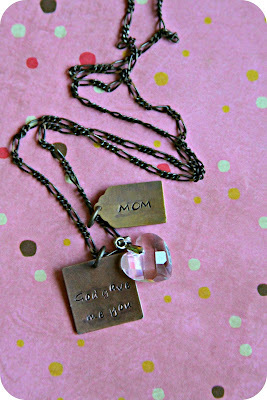 And I loved that I could personally design this necklace for my mom. The saying "God gave me you" is used a lot for brides & grooms in the wedding/marriage scene. But I was adopted & feel like that statement perfectly describes how I feel about my mom. Michelle, the owner & stamper at Polka Daisy, has been kind enough to let me host a giveaway of one of her amazing creations! The winner will receive the Two Tags Necklace. You can customize it any way you want: names, dates, inspiring words, etc. To enter, leave a comment on this post & I'll pick a winner in one week: on Sunday, June 3rd. Be sure to browse Polka Daisy for other personalized necklaces, keychains & bracelets. *Disclosure: This review was written in return for product compensation from Polka Daisy. The opinions expressed are my own. How cute! I would love to put my two girls names on the tags and give it to my Mom! My two are her only Grandkids, so I think it would be a special gift. And thanks for the Summer Diary! My girls and I love checking in to get ideas for our own summer adventures! I would love to win this . . . I have two boys, one for each tag! love handstamped jewelry! thanks for the chance to win! please count me in !! Oh, and are you taking international entries? 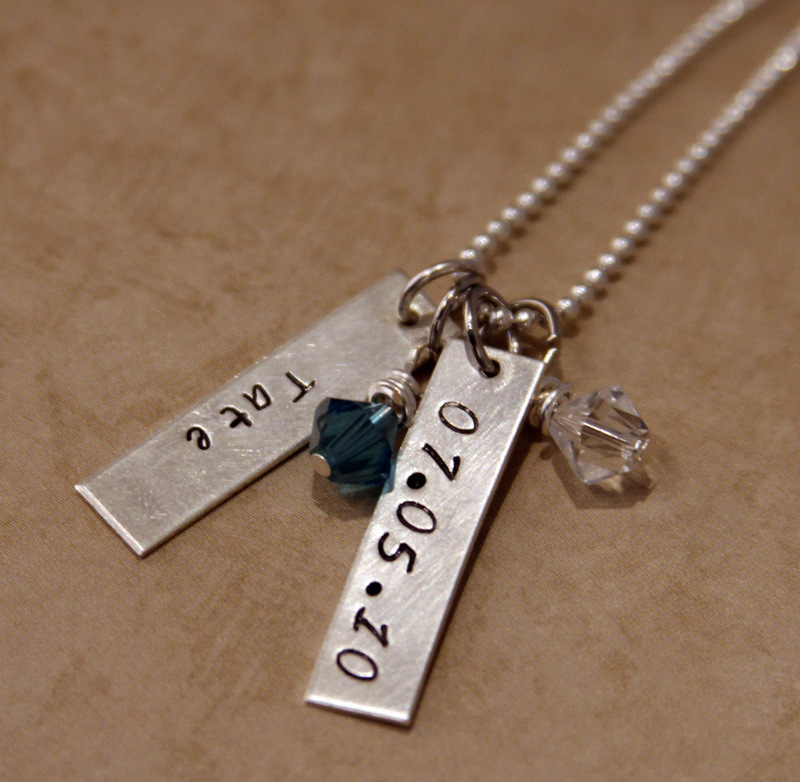 Because I'd love to win a necklace and have my daugthers' names and birthstones on it. WOWZA What a SWEET giveaway! Thanks so much for the chance. i keep eyeing hand stamped jewelry but never get any. Would love this! OOOH! Sooo cute! I've seen these adorable hand stamped jewelry pieces all over lately and LOVE them! This is so fun. Thanks for the giveaway chance Nikki! SO very sweet! I find out this week if I am pregnant, would love to have this as a keepsake for the (hopefully) new baby! Thanks!!! wow her work is adorable, would love to win one. Oh this is so cute! My sister is pregnant with her first baby, so I think I'd gift it to her. Would love to with the a necklace! Super cute giveaway! Thank you...but how do you select one date out of sooooooo many years of living. I have so many awesome days worth remembering. Got my fingers crossed! great original gift. well done! Hope international readers can enter? !